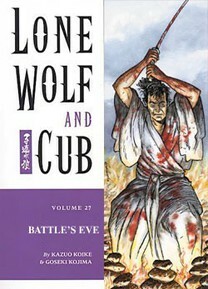 Two swords remain planted in the ground, awaiting the final duel between the conniving Retsudo and the vengeful Itto, and little Daigoro guards the two blades with his life. Indeed, his life is threatened when a stampede of villagers escaping a burning village almost plow him into the dirt. Impressed townfolk decide to stop and help him, staying for a while on the same beach. For once, Daigoro experiences the joy of being a child, playing with the other children, but that peace won't last long. Yaygu Retsudo, imprisoned in the castle of the shogun, deceives his way to freedom and commands the very last members of the Yagyu ninja to kill Itto! But knowing swords alone won't kill him, Yagyu sends a strange and fascinating weapon to the battlefield: the exploding ninja!